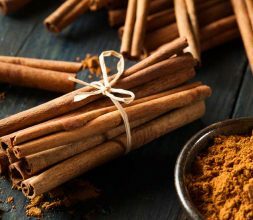 Cinnamon is a powerful antioxidant that helps the body fight disease and infection due to its anti microbial and anti-bacterial properties. Strenghtens the immune system and helps us fight infections and basically be sick less often. Cinammon adds a sweet and pleasant taste to any dish. You can use it as a replacement for sugar in many recipes or just add it in for an extra warm taste. It’s delicious and good for you!